We often receive requests to participate en cooperate charity funds by fundraising. Unfortunately it is impossible to fulfill all these requests. That's why we have decided to pick one specific charity fund to support on a regular base. From 2015 untill 2019 we supported the Ronald McDonald House in Veldhoven, Netherlands. We provided items from Joop Zoetemelt, Marianne Vos, Max Verstappen etc. and brought these items up for auction. We did all the administration and sales procedures to formalise auction and finally transfered the money to the Ronald McDonald House. Untill today we still have big sympathy for the Ronald McDonald House. They do fantastic work. That being said, unfortunately sad personal reasons decided me in january 2019 to choose a new Charity fund to support; Pink Ribbon. Pink Ribbon Inc. is an international charity organization aimed to create a global community to support breast cancer patients, survivors and their families all over the world. 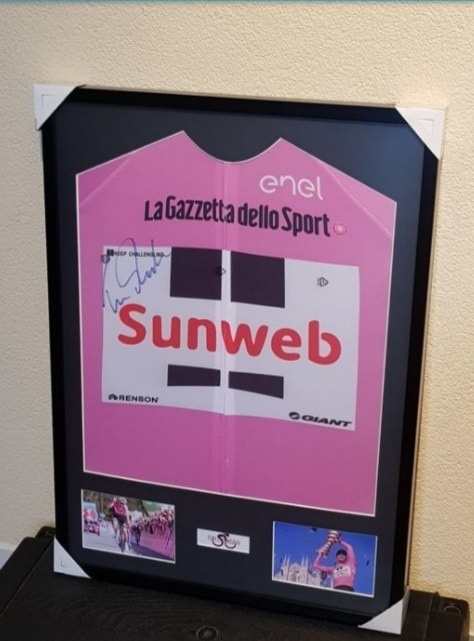 Friday 8 february next we will start our "new campaign" by selling a framed Pink jersey (Giro) hand signed by dutch legend Tom Dumoulin. This item will be sold by auction on www.Catawiki.nl (Sports memorabilia auction) and of course the yield is for Pink Ribbon. If we can only contribute a very, very, very little piece to reduce the dramatical numbers of breast cancer (1 from 7 women gets involved with breastcancer) our mission already has been accomplished.